After winning the Super Bowl in convincing fashion last year, the Green Bay Packers showed that they were without a doubt the best all-around football team in the NFL and could potentially have many promising years ahead with a young core of talented players on both sides of the football. A great test for the defending Super Bowl champions came right out of the gate against the New Orleans Saints in the NFL season opener and the Packers didn’t disappoint as they were able to dominate offensively and come away with their first win of the season. Despite getting their first win of the season with a virtually unstoppable offense led by reigning Super Bowl MVP quarterback Aaron Rodgers, the Green Bay Packers weren’t as good as many people expected them to be on the defensive side of the football. With defensive superstars Charles Woodson and Clay Matthews leading the way, the Packers defense was considered to be one of the best in the NFL for the second straight season, but they have struggled against the Saints and most recently against rookie quarterback Cam Newton and the Carolina Panthers. In Week 3, the defending champs will have their work cut out for them for the third week in a row as they will head to the Windy City to take on the arch rival Chicago Bears. Even though the Bears showed some flaws in their game last week in the loss to the New Orleans Saints, Jay Cutler and company have are a very good football team on both sides of the field and should prove that point against their arch rivals at Soldier Field this Sunday. There is no question that the Green Bay Packers are still considered to be the best team in the NFL right now as they top the NFL power rankings and are undefeated at 2-0 coming into this showdown with the Chicago Bears, but last season the Bears were one of the teams in the league that were able to get the best of Aaron Rodgers and company in the NFL regular season. Even though the Chicago Bears were able to top the Green Bay Packers in the regular season last year, they fell hard to their division rivals in the NFC Championship game and were exposed for their weak offensive line once again. In this Week 3 showdown, the Packers will try to have a repeat performance and put a tremendous amount of pressure on quarterback Jay Cutler. 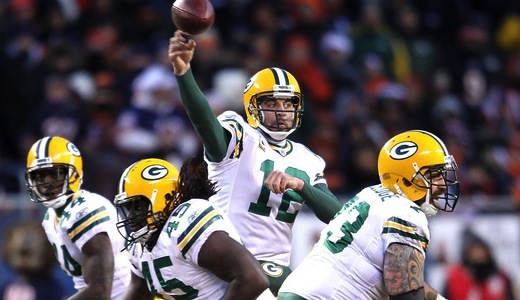 As of right now, the Green Bay Packers are favored to win this NFC North battle with a -4 point spread. This is solid spread in my opinion as I can’t see the Bears giving the Packers much of a challenge in Week 3, but Green Bay did struggle last week against Carolina and might have given Chicago some game film to use to their advantage. Take the Packers at -4.